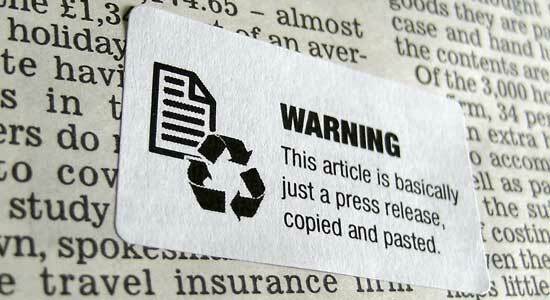 You are here: Home / Editing & Publishing / Journalism warning labels. Full of win! As many people do in this day and age of being overwhelmed by information, much of what I read online is via RSS feeds. I use Google Reader, simply because it’s central – and it syncs to my portable time-stealing device (otherwise known as a smart phone). But one of the things about Google Reader is that it ‘suggests’ things you might like. Mostly it’s full of crap, but today I saw something awesome: Journalism Warning Stickers. To read the blog post about the hows, whys, and wherefores, click here. Highly recommended.